• Deborah Simmons can be contacted at dsimmons@washingtontimes.com. Term limits would drain the swamp…. A WELL USED GALLOWS on the front steps of the US Capital Building would drain it RIGHT NOW! Built in a circle with 20 or so stations with the ‘least egregious’ in the Number One position and the worst in the last position. Trip the trap door at 15 second intervals giving ALL the participants plenty of time to SEE FIRST HAND what their end will look like. Televised around the world, the message would get out that the “Silent Majority’ is NO LONGER SILENT! DC would be empty the following day, all flights out would be booked for months, and the ILLEGAL BORDER CROSSINGS going OUT would be fun to watch. I agree. Public beheadings would help clean things up now, but we STILL need term limits for later..
Back in the 80’s, Chuckie and Nancy were wagging their fingers at Ronald Reagan. Fast forward to 2018 and once again, Chuckie and Nancy are still wagging their fingers at President Trump for nearly the same issues. What is the common element? Why Chuckie and Nancy, of course. They are the Problem! Back after FDR served 4 terms, America decided that 2 terms was enough for our Presidents. Now with the left sliding down the Path to Com, er um “Socialism” (which is communism by vote instead of by gun), perhaps America will wake up and consider term limits to help finally “FIX” our broken government! Along with term limits let us as We The People, make a contract with those we elect to office. Make it so if they run for office on a platform and are elected, they have to fulfill the terms of that contract by doing what they were elected to do. If they go contrary to what they ran on then we can call them back and if they can’t explain why they did or didn’t do according to the contract. We then have the right to remove them from the office and replace them with an alternate. If we can’t have a way of holding them accountable then the swamp will never be drained. And when they willingly go AGAINST that ‘contract with the people, ALLOW US TO SUE THEM for wrongful advertising to get our vote. Term limits might help but the swamp is made up of government workers mostly. They are for the most part liberal types that can’t make it in the private sectors. Maybe 10 years and out for them? Especially when its so bloody hard to FIRE any of them.. Term limits will never happen. It will have to pass the House and Senate. My representative been in the house since 1990. I have seen many representatives and senators who have made it a career instead of volunteering. That should have appeared in the Constitution when it was being drafted. We are fortunate that an amendment was passed for term limits on the president. PITY WE the people can’t vote it in FOR THEM! 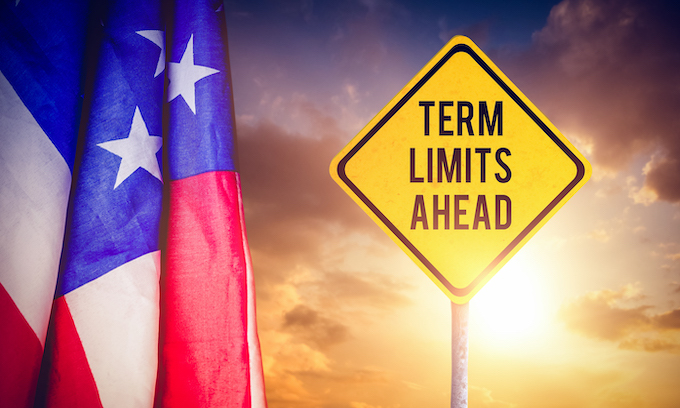 You are correct that the House and Senate are unlikely to pass a term limits amendment, but Congress is only one way amendments can be proposed. The states can also call a Constitutional convention via Article 5. There is a large movement to do just that regarding term limits for Congress. See https://www.termlimits.com/ and join up in the cause. Everybody wants term limits for all politicians except the ones they voted for. Better option might be limiting or eliminating pensions. I want term limits PERIOD, i don’t care who they are..
And replace the current garbage with new garbage… the Left has an endless supply. My mom was a dem wayback when I was growing up. So I followed suit. Then several years ago, I realized most of the ills of this country were caused by dems and I became an independent. I asked my dad why he didn’t vote and he said “if they aren’t crooks before they get elected, they soon will be and I now believe that. Look at all time and the money that has been wasted over the last several years trying to blame Trump for collusion. And even now with Mueller’s report about to be released, they still won’t give up. What I would like to know is why people like Hillary who said they were dead broke right before she ran, could accumulate so much money now. And about the only job Bernie has had has been in the govt so why did he become a millionaire. It just gets me that they in govt are trying to work to make things better for the citizens but spend all their time trying to find some dirt on the opposite party. Health care and immigration should be the only things they are working on right now. And It upset me to no end when the one state, I think New York, voted not to give tuition to gold start familes but to immigrants. When are the voters in this country going to wake up. I completely agree – we should have term limits on all elected offices; ideally state as well as federal. In *ADDITION*, we should have term limits on *ALL* federal judgeships. As long as we’re in the wishful thinking area, we should also have sunset rules applying to all laws and federal regulations. Every law and regulation should have to be reauthorized by Congress and the President, say every 10 years. The idea that anyone is responsible for violating some nonsense legislation passed 200 years ago is nuts. Every rule coming out of the bureaucracy should have to be blessed the same way. Hopefully, this would take some power away from the unelected bureaucracy. Off topic, I think that prosecutors should be personally liable for maliciously withholding evidence that would exonerate a defendent. By personally liable I mean serve the same sentence that the defendant is/would serve if convicted. I fully agree with the judges having term limits, but why the ‘every law needs to be re-authorized every 10 years’?? not gonna happen,lobbyist will not let it happen they have to much invested in the morons on capital hill who do there bidding not we the peoples bidding. stop the flow of money into d.c. and that may help. One look at the freshman class in the House (Tlaib, Ocasio-Cortez, and their ilk) should convince anyone that draining the swamp is risky – it can result in alligators biting us in the backside. Then maybe we need to drop in some venom to NEUTRALIZE those “gators”..
in the late 80’s, Lil Chuckie Schumer and Nancy Pelosi were finger wagging that Reagan was the problem. Solution: Chuckie and Nancy are red-herrings. Term limits would solve that problem yesterday. However, there’s little chance that those cockroaches would drain their own swamp! We need an alternate solution that bypasses the House and Senate! The only way would be a convention of states..